The Doctor partakes in an altogether different mobile telephone in this delightful ad. Back in its heyday, Doctor Who ended up doing all sorts of weird and wonderful tie-in advertisements, where the stars of the show got in character to shill things like Prime Computers and what have you. 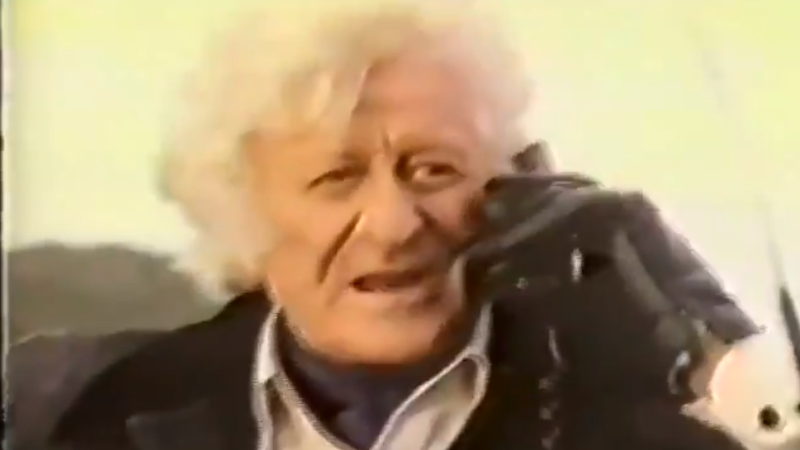 But there’s something particularly delightful about the Doctor—here specifically Jon Pertwee’s incarnation—being used to hock an early version of a mobile telephone. Because...well. What is the TARDIS if not that? If anything, the ad—for Telecom New Zealand—makes that all the more oblique by randomly turning the TARDIS from its usually-stuck Police Box exterior into a red phone box. But that’s not even the most bizarre thing. Why is the Doctor ringing an Earth phone company to get the TARDIS repaired? How did he know to stop perfectly in front of a car that just so happens to have one said company’s early mobile phones? Why not just pilot the TARDIS directly to Telecom New Zealand instead of going about it the long way around? Sure, it’s apparently not working right, but if it can precisely land where it needs to here, why not go straight to the source—or even better yet, Gallifrey, where they’d actually know how to fix a wonky TARDIS? We haven’t even got to the bit where the Doctor decides to wait for his service by...fishing with the poor guy whose car he stopped? It’s ridiculous. And delightful.